Cornbread (Bread Revolution Series) – I'll Make It Myself! Are you guys sick of kabocha and kabocha purée yet? I never am*, but let’s change it up a bit today. My first encounter with a vegetarian cookbook of any sort was my dad’s copy of Anna Thomas‘s The Vegetarian Epicure, a memento of a few months in the ’70s when he dabbled in meatless cooking. I have no recollection of my dad (or my mom) ever using VE for anything but the cornbread recipe that we brought with us to every Thanksgiving dinner. I find vintage (sorry, parents) cookbooks really fascinating from a social-history standpoint, so perhaps I’ll peruse the book again when I’m home next. 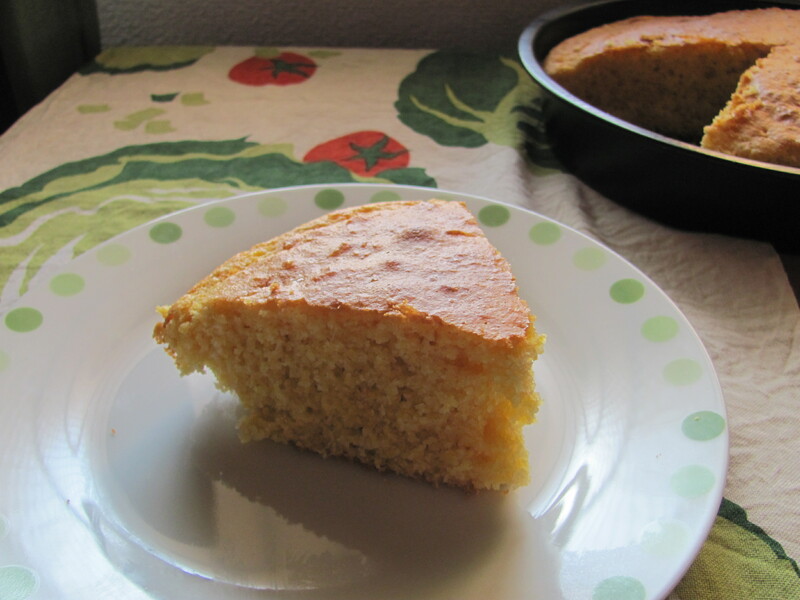 At some point during my stint in the countryside, I found some corn meal at my local supermarket and suddenly all I really wanted was a slice of that cornbread. My parents may not fully understand my obsession with cooking from scratch (or my interests in gender and Japan) but they love me and support me–and I’m thankful for that. I often joke that I don’t know how to express love and appreciation for people except through cooking, so parents, this one is for you. Happy Thanksgiving. Japan notes: This bread isn’t particularly wet or dense, so it cooks up just fine in a 20×20 cm (8×8 in) square pan or a 20-cm (8-in) round cake pan (traditional in my home). I’ve used both corn meal (Home Bakery brand) and corn grits (Tomizawa brand) [see flour post] with success with this recipe; grits will give it more texture. Do NOT use corn starch (kôn stâchi, コーンスターチ) by mistake! Recipe barely adapted from The Casual Kitchen, who adapted it slightly from The Vegetarian Epicure. Serves ~8 as a side dish. 1. Melt butter and set aside. 2. Preheat (yonetsu, 予熱) oven to 190° C (375° F). 3. Mix the dry ingredients together (flour, corn meal/grits, sugar, baking powder, salt). 4. Add the wet ingredients and mix to incorporate. 5. Grease the pan and pour the batter in. 6. Bake at 190° C for 20-30 minutes. If the top is browning too much, cover with foil about 15-20 minutes in. Serving suggestions: Don’t save this recipe just for Thanksgiving–it’s great with chili, stir-fry, roasted vegetables, winter soups, eggs, or just with a bit of butter. Also, if you’ve never had cornbread before, it is supposed to be a bit crumbly–you didn’t mess up! *There are four running jokes about “LM food” amongst my friends: “kabocha always,” “reduce the sugar,” “use whole-wheat,” and “so I made it myself.” I think if I work all four into a post, they get to drink. ** You can use white sugar (satô, 砂糖), light brown sugar (sanontô, 三温糖), or brown beet sugar (tensaitô, てんさい糖, 甜菜糖). Pingback: Kitchen Library 2012.12.13 | I'll Make It Myself!